~ Two of my favorite things are knitting and reading, and the evidence of this often shows up in my photographs. I love seeing what other people are knitting and reading as well. So, what are you knitting or crocheting right now? What are you reading? -yarning along with Ginny. I'm still plugging away at my noro log cabin squares-I had to put most knitting aside for a little while because I fell on my wrist a few weeks ago. After the fall, knitting was somewhat tolerable but purling hurt. (I knit continental.) I think I'm back to being able to do both without pain. I was doing the Follow Your Arrow knit along when I fell, and had to put the shawl aside. Since, I've sort of fallen out of love with it though and i'm not sure I should continue it. I'm wishing I had done the circular shaped clue in one colour rather than two. I'm not sure if i'm going to continue it or not. In effort to be more active during these frigid winter months when walking outside seems to hurt my face (seriously-this has been an insanely cold winter) I bought a used treadmill on the weekend. The best part? I can actually walk at a pretty fast pace while knitting! This changes everything. I need to make a wrist project bag though so I don't get tangled in my yarn and wipe out. I can definitely see that happening if I'm not careful. Apparently though, I'm not the only one attempting to walk and knit. which makes me feel a little less crazy. I started "the Virgin Cure" a while ago but put it down over Christmas, so I've restarted reading that. I really enjoy some of the characters; they remind me of people I've known. Sometime mid January, I found myself face down on our living room's hard wood floor-all in the name of attempting a couple of ten second 'planks' that the boys thought were funny. Apparently there's a bit of a social media fad, people will plank in different spots and take their picture and say "look, I planked at the Eiffel Tower!" etc. I guess it makes sense. 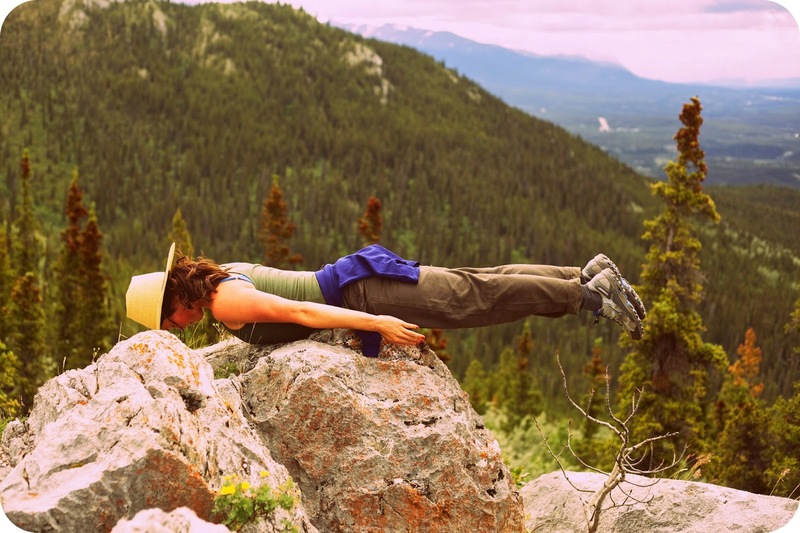 If we take pictures of our coffee and breakfast every morning and post it on social media, why not planking? haha. Anyway, I lasted for one, and maybe 4 seconds, tops, into my second plank before my arms gave out in a shaky mess. At the time, it was mildly funny, but mostly I was stunned by how terribly out of shape I had become. I lost a lot of weight last year, about 60 lbs, actually. But somewhere between different life events it started creeping back on. Not all of it, but enough of it that it really motivated me to stop being stupid and start paying more attention again to what I'm eating. It's so easy for me to throw healthy habits on the back burner when life gets chaotic, and I really need to learn to keep going regardless of what's going on around me, or within my life, be it a physical obstacle or an emotional one. I've decided to begin posting on my blog to keep me motivated and accountable to looking after my health. I know this is sort of an offspring from what my blog tends to usually be about-I usually only touch on recipes, knitting, crafting, homeschooling, the fun stuff. But this is a huge part of my life currently and not sharing it is starting to feel a bit... weird. And in case anyone is wondering why I haven't posted much about knitting lately, it's because I fell on my wrist a few weeks ago while shoveling our stupidly long driveway and couldn't knit for a little while until it healed.-Just putting that out there! I still love knitting, and plan on doing a lot more of it in the near future. Don't worry, I don't want to turn this into a "diet blog". I'm still me. I still love knitting far more than planking, and I don't think that will ever change. But i'll probably post about this area of my life a lot more than I have in the past. And, I figure I can plank, (or whatever else I feel like doing for exercise) and then knit even more happily knowing that I've put time in on exercise first. I've always been a salty over sweets sort of person. Not that chocolate doesn't have it's place in my life, because it definitely does. But when it comes to those cravings, it's always been the salty things that have entrapped me. Popcorn, chips, salsa...- And even if i'm having something sweet, I still feel like there should be something salty to go with it. When I first heard about Kale chips I thought people were crazy. I loved Kale, so there was no problem there, but I really couldn't believe that as Chips it would be all that it was cracked up to be. But then I had them and fell hook line and sinker. I was saved from potato chips forever! Until I learned how much they actually cost. My favourite Kale chips to buy are 6.99 for a pretty small bag. (About the same size as a snack size bag of potato chips, and much lighter in weight.) And when I'm lucky, they go on sale for 3.99. And if i'm REALLY lucky (which is rare) they're 2.99 and I buy several. I can buy organic kale for 2.99 that makes 4 times the chips than what comes in a bag. And if I look on the reduced produced rack, .50-99 cents a bunch. And yes, slightly wilty Kale works wonderfully for Kale Chips. When I first started looking into making these, the process seemed so complicated. There were pureed vegetables as "sauces", nutritional yeast flakes in place of cheese (for vegans) blenders and food dehydrators. I attempted these recipes a few times and they turned out okay, but were a lot more work than they were worth. I wanted something that I could throw in the oven in with 5 minutes or less of prep time. Through some trial and error, I realized that less is more with these. Forget the sauces, period. All you need is a baking sheet, an oven, some olive oil spray and some of your favourite seasonings. First, preheat your oven to 300. Arrange the Kale in a single layer across the tray. It's no biggie if you have pieces slightly over-lapping. I usually end up putting mine in the oven before it's even totally pre-heated, and they only take about a half hour. (this might vary from oven to oven.) You'll want to test one to see how crisp it is before you pull them out. It's good to check them frequently for the first few times that you make them because burnt Kale isn't very yummy. Even though I've lowered myself to eating it, all in the name of not letting my precious greens go to waste! And they're perfect to take with you on the go, just keep in mind that they're far more fragile than regular chips so it's best to keep them in a hard sided reusable container than a resealable bag. I made this mistake once and ended up what looked like a bag of oregano in my purse....and attempted to eat it anyway. SO very sad. Say it with me folks, Friends shouldn't let friends eat powdered Kale.